The QuickScan™ QM2400 2D imager is the ideal cordless solution for multiple general purpose data collection applications such as POS Checkout, Inventory, Price Checking and Shelf Replenishment. It is also excellent for Access Control applications in exhibitions, trades shows and other similar indoor events. 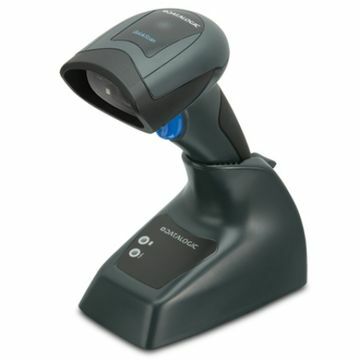 Featuring Datalogic’s STAR Cordless System™ 2.0, the QuickScan QM2400 2D provides a simple point-to-point connection with secure radio communications with no risk of interference with Wi-Fi infrastructures and very low sensitivity to obstacles. The QuickScan QM2400 imager features a new illumination and aiming system developed with the unique intent to reduce visual stress of the operator during daily scanning activities. It consists of a soft, dark red illumination combined with two blue LED triangles pointing at the targeted bar code. With the popularity of 2D bar codes spreading across all market segments of the data capture industry, the QuickScan QM2400 2D imager enters the arena with more affordable pricing and virtually no drawbacks with area imaging technology. It is also capable of reading mobile phone displays and loyalty cards at the POS.